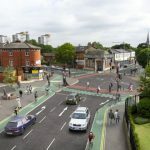 Manchester Friends of the Earth | Show your support for the Chorlton to Manchester Cycle Way! Making cycling easier and more pleasant is an ideal way to help people save on travel costs, lose weight, become healthier and more active. More people cycling will also help tackle transport congestion, improve air quality and reduce C02 emissions.